Michael Pascuzzi may not have won Thursday’s episode of “Jeopardy,” but the Florida resident left the show an even greater winner. Pascuzzi, a resale store manager in Orlando, proposed to his girlfriend on air during the contestant introduction segment of the show. “What is yes?” Maria Schafer responded. According to the show's contestant coordinator, Corina Nusu, Pascuzzi mentioned before the show that his longtime girlfriend was in the audience. "The Marvelous Mrs. Maisel" swept the Emmys and HBO's "Game of Thrones" came back with a "Best Drama" win during TV's biggest night. 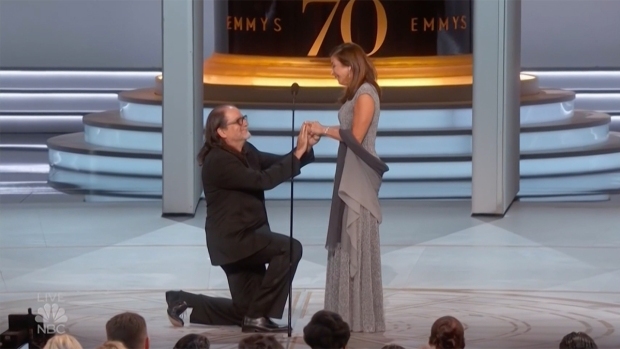 But it was director Glenn Weiss who provided the most touching highlight of the night after he pulled off a successful proposal to his girlfriend, Jen Svendsen, as the cameras rolled on-stage. “I jokingly asked when he was going to ‘put a ring on it,’” Nusu wrote in a blog post on Jeapordy.com, explaining the proposal’s backstory. Nusu said Pascuzzi responded, "Should I do it now?" "And just like that, in a matter of minutes, a proposal was put together," she wrote, noting host Alex Trebek was in on the surprise. After the first commercial break of the show, when Trebek normally introduces the contestants and makes small talk using background information from his cue cards, the host noted there was nothing written about Pascuzzi. "So what do you want to talk about," Trebek asked Pascuzzi. A shocked Schafer, said "yes" in question form — in true Jeopardy spirit. Too quick, Trebek joked: "I was about to say, we’ll have the answer to this after the commercial break." Pascuzzi thanked the show on Twitter. "I’m the happiest guy tonight and it will be great memory Maria and I will share forever."